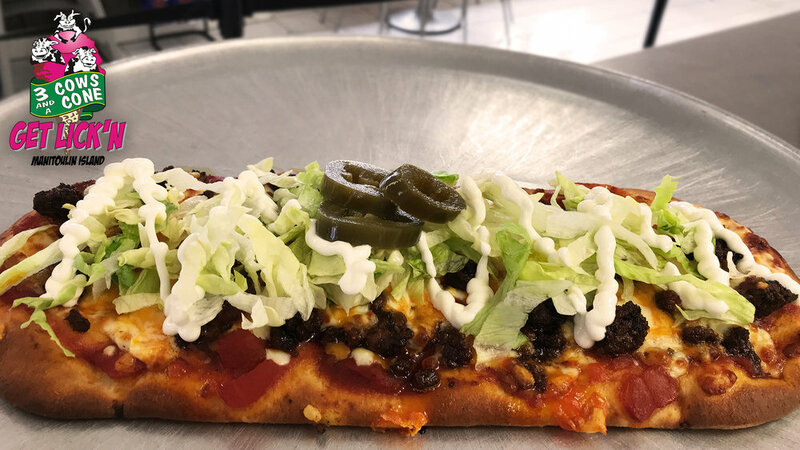 As you may have noticed, 3 Cows and a Cone has added gourmet flatbreads to the menu - we have a different flatbread option for everyday of the week! Although these flatbreads are unbelievably delicious, a lot of people still don’t know what they are exactly. Are they a pizza? Kind of - but not really. They are their own unique savoury dish. And today, we are here to clear the air and answer your burning questions about these enticing, fantastic flatbreads. What’s the difference between flatbread and pizza? One of the major differences between the two is the dough that is used. With pizza, the dough is typically made with yeast, allowing it to rise as it cooks. On the other hand, flatbreads are usually made with unleavened bread - the dough is made without yeast, and keeps its shape throughout the baking process. So flatbreads are much thinner in comparison to pizza. Another distinction between the two is the toppings. The modern version of pizza originates in Italy, as most of us know. In the 1700s, Naples was a city full of of working class citizens. Yeast dough was an affordable food item, and tomatoes, cheese, and garlic became very popular toppings. Even today, pizza retains these classic toppings - go-to favourite recipes usually include dough, sauce, cheese, meat and veggies (sometimes even fruit). Flatbreads have been around for a very long time, dating back to ancient Egypt (each culture has a different version, of course, ranging from Mexico’s tortilla to Ethiopia’s injera). Flatbreads generally feature lighter toppings than pizza, and do not abide by any rules. They can feature different assortments of cheese, or none at all. Most flatbreads don’t even use tomato sauce, and instead venture into the world of delicious, unexplored savoury sauces (or none at all). You can be very creative and adventurous when creating flatbread recipes, because anything goes. 3 Cows and a Cone Chicken Broccoli Alfredo flatbread. Made with Alfredo sauce, broccoli, chicken, garlic and parmesan. What’s the hype about flatbreads? Besides the obvious (they’re delicious), our flatbreads are promoted as a personal-size dish. They’re sliced into easy-to-eat pieces, but there’s no way you’ll want to share. They’re the perfect size for a quick lunch, and they’ll even hit the spot for dinner. The picture below is what one of our flatbread orders looks like. They are 12 inches long and 5 inches wide. It’s a lot of fun to try out the different flavours of flatbreads. Each and every one of them is one-of-a-kind, comprised of delectable ingredients that you otherwise might never have envisioned together. It’s a great way to try new foods and test your palette. Instead of sticking to your basic weekly orders, switch it up with a gourmet flatbread. You might just discover your new favourite thing. Pesto is a tasty green sauce often used in Italian dishes. There are variations of the ingredients involved, but the type we use is made from crushed basil, garlic, oregano, and olive oil. Pesto is a fantastic flatbread base, sweetly nestled with aromatic flavours, in all its creamy glory. 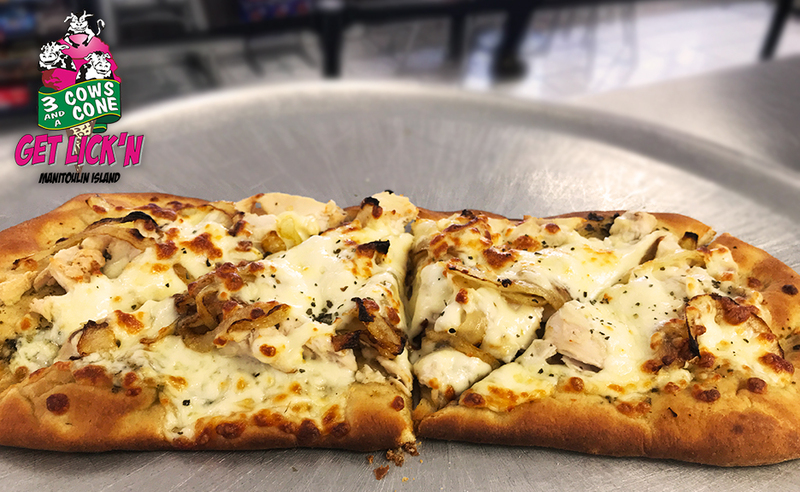 Last weekend we tried out a Chicken Pesto flatbread, topping it with pesto sauce, mozzarella cheese, chicken, mushroom, and onion. This dish is a wonderful deviation from your standard pizza - the flatbread completely absorbs the zesty notes of the pesto sauce, satisfying your taste buds with every flavourful bite. What flatbreads does 3 Cows and a Cone have? This winter we will be experimenting with all sorts of different flatbread recipes. We are excited to unleash brand new creations and flavours upon the island! This will be a long winter season, and the best way to pass the time is by gorging on delicious food. We have a different flatbread available each day of the week. 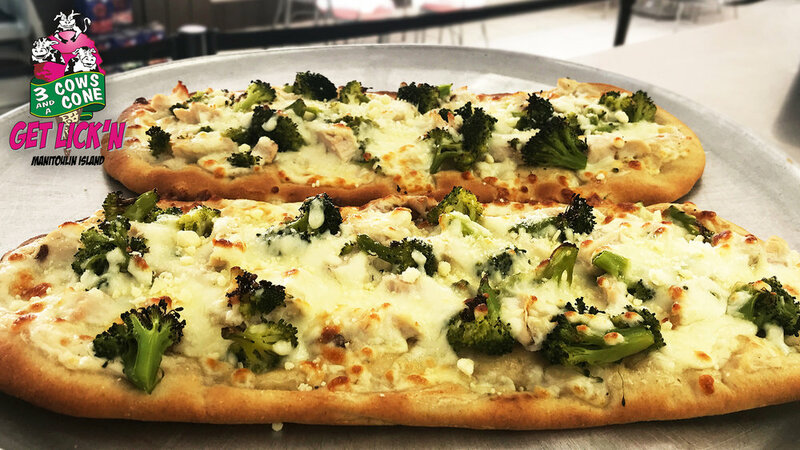 For the month of December, we are offering Chicken Broccoli Alfredo on Mondays, Taco on Tuesdays, Buffalo Chicken on Wednesdays, Bruschetta on Thursdays, and Philly Cheese on Fridays. We have Chicken Pesto available on Saturdays and Pulled Pork on Sundays. This may not be a static schedule in the new year, but for now we are rolling out these recipes to see what kind of wave they can make! Let us know what recipes you’d like to see us offer! We might just give it a try.